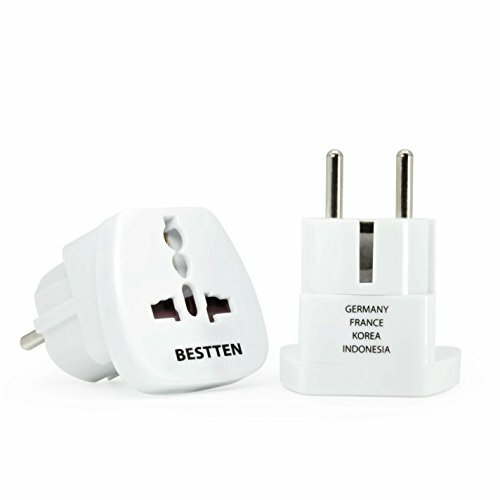 BESTTEN Universal Travel Plug Adapter Series Product is made with safety design and high-quality material, which is the best travel partner accompanying you to explore the world. Europe, Germany, Russia, Afghanistan, Albania, Algeria, Armenia, Austria, Azerbaijan, Belarus, Bulgaria, Croatia, Denmark, Egypt, Estonia, Ethiopia, Finland, Greece, Greenland, Guinea, Netherlands/Holland, Hungary, Iceland, Indonesia, Iran, Italy, Jordan, Kazakhstan, Kosovo, Kyrgyzstan, Latvia, Lithuania, Luxembourg, Madeira, Moldova, Monaco, Montenegro, Mozambique, Norway, Portugal, Romania, San Marino, Serbia, Slovenia, South Korea, Spain, Sweden, Tajikistan, Turkey, Turkmenistan, Ukraine, Uruguay, Uzbekistan, Vatican City. Exceptions may occur. The input is a universal receptacle that accepts all types of connectors (Including: 2-Prong US "polarized", 3-Prong US grounded, European, UK, AUS and India plug standards. But not the large South African plug). The adapter does not change the Voltage. Please check the voltage standard for the travel destination and use a Voltage converter with the adapter if needed. (example, Europe use mainly 230 Volts). Many electrical devices such as AC/DC chargers for Laptops, cameras etc. allow a wide range Voltage (110-240 Volts) and eliminate the need of a Voltage converter. Sometimes electrical device have a switch for either 120 or 230 Volts (remember to set back!). Please check the specifications on your equipment. Powering a 120 Volts device with 230 Volts can destroy the equipment and cause fire.